Survivor: Africa (2001) - 15th place, 2nd out. Voted out in Episode 2, "Who's Zooming Whom?" (Day 6). Africa Ep. 1 RC/IC: "Trail Blazer" - Helps push the cart, as does the rest of Boran. Boran fades at the end, loses. Africa Ep. 2 RC: "Stairway to the Stars" - Helps carry and follows along, but Boran again fades at the end, loses. Africa Ep. 2 IC: "Safari Supper" - Drinks her first-round shot at the Damu Bar, but Boran loses the tie-breaker. Africa, Ep. 1: Diane Ogden (voted out, 6-2). Africa, Ep. 2: Five votes, from Ethan, Kim J., Lex, Kelly, and Clarence (voted out, 5-2). 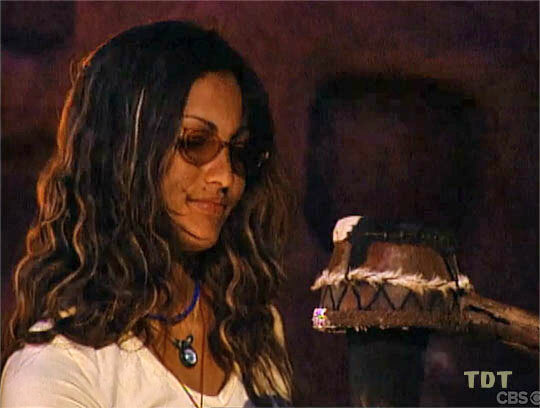 CBSNews.com (9/25/01): "Meet the new Survivor cast"
Jessica Shaw at EW.com (10/25/01): "Jessie tells EW.com about being exiled"
SurvivorOz podcast interview (7/10/12): "Jessie Camacho interview"
"Camacho was born in Mayaguez, Puerto Rico, and remained there until she was 14 years old. Moving to Florida in 1989, she attended Winter Park High School. In January 1991, at age 16, she was crowned "Miss Puerto Rico, Orlando." After graduating high school in 1992, she worked as a model before deciding to enroll in college. In 1996, she received an Associate of Arts Degree from Valencia Community College, where she was on the dean's list. She then immediately enrolled in the school's police academy, where she completed a grueling six months of physical training and intensive classroom work. In 1998, she was named one of the top three up-and-coming leaders in Central Florida by the Mayaquezanos organization. In March 2001, she was given the Juan Ponce de Leon Award for Future Leader by the Puerto Rican Parade of Central Florida. Citing her grandfather, a former police officer in Puerto Rico, as her hero, Camacho previously worked as a police officer for the Altamonte Springs Police Department and a security officer for a major theme park. Her hobbies include rollerblading, mountain biking, personal fitness, dancing and kickboxing. She also collects cartoon movies. Jessie Camacho has a dog, Babsy, and a fish, Blue. Her birth date is September 24."